On Friday, U.S. Magistrate Judge Mark Pizzo gave Odyssey Marine Exploration, a deep sea treasure recovery company, just one week to return 17 tons of treasure from the Nuestra Senora de las Mercedes shipwreck to Spain. The coins and artifacts have been at an undisclosed storage facility in Florida since 2007, and Odyssey has been fighting to retain the objects. Spain showed an interest in the discovery, claiming it was the shipwreck site of The Nuestra Senora de las Mercedes, sunk in October of 1804 by a British fleet. The 34-gun frigate was sailing from Peru and was within a day’s sail from Spain. According to the Spanish government’s filing in district court, the ship exploded after being hit on its power magazine. Spain contested Odyssey’s claim, arguing that the ship and its contents had not been abandoned and still belonged to Spain. Peru then entered the litigation, contesting ownership of the coins because they were minted in Lima and had never touched Spanish soil. 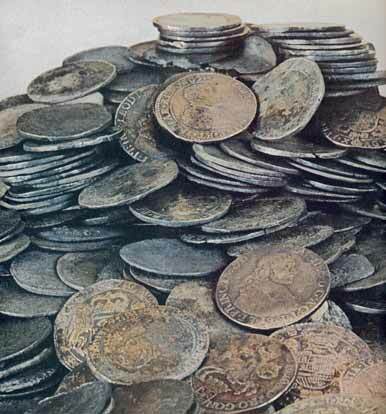 In 2009, the federal court in Tampa ordered the treasure be turned over to Spain. Odyssey appealed the ruling and took the case to the appeals court in Atlanta. In September 2011, the appellate court affirmed the lower court’s ruling. Melinda MacConnel, vice president and general counsel for Odyssey, said Spanish officials will be given access to the treasure and the company won’t contest the ruling. She said the company followed federal maritime law and did nothing wrong in salvaging the wreck and bringing it back to the United States without the cooperation or permission of Spain. She blamed politics for the courts’ decisions since the U.S. government publicly backed Spain’s efforts to get the treasure returned, and she lamented that the company was unable to bring the case to trial. MacConnel’s assessment is consistent with my own analysis of the applicable law, as indicated in my article, High Seas Shipwreck Pits Treasure Hunters Against a Sovereign Nation: The Black Swan Case. Odyssey says it will turn the treasure over to Spain and not to further contest the rulings. Read the Washington Post article: Judge rules Spain can take control of shipwreck treasure recovered by Fla. company next week. Read other articles on Cultural Property & Archaeology Law on this topic. Thanks to Kristina Bauer for her assistance with this post. I think that is a load of crap.. To me the only reason that spain is going after the coins now, it all has to do with them being in debt. Come on now do you really think that they are going to keep it, me think NOT… I feel they are just going to melt it down and pay off the debt they have. Shoot if I were to find something in the ocean that has to do with spain I would never tell. Talk about greed.. Learn how to control your money and you wont be in debt.. This finding is ridiculous! Is Spain going to reimburse Odyssey for all it’s costs in the recovery, labor, equipment, legal counsel, etc? I think there should be a case filed for full reimbursement by the Spanish Gov’t for the archaeological work performed as well as a “cut” of the treasure (which should rightfully belong to the ones who recovered it!) This court ruling is B.S.! No one should disturb historic sites, submerged or otherwise, in an attempt to make money off the sale of those artifacts. That’s what people should understand. No treasure hunter has the right to disturb an archaeological site. What money Odyssey spent, they did so at their own financial peril. Leave artifact recovery to the archaeologists and treasure hunting stories to children’s books. (1) Odyssey is a treasure-hunter company, nothing to do with archaeology. (2) Yaya is clearly on the side of looters and destruction of UCH. Spain is NOT going to do what you say, and it is incredible you can think something like this. The collection, once estabilised, will go to the National Museum in Cartagena, and the idea of the Govt is to share the scientific results (and perhaps some of the collection, once assessed the possibilities) with other museums and scientific institutions here and in America (Perú and the US, among others). Yaya, I’m sorry to say this but you don’t have idea on what’s going on! (3) Kate, may I go tomorrow to your house, take your patrimony without anything permit from you, obliged you to litigate in my country and, once given the reason –in a clear decision based on law and not on politics– should you have to pay me for the cost I illegally and voluntarily decided? Please, be serious. The US courts, in a well founded decissions (well, I must say: in FOUR clear decissions, two from Tampa and two from the 11th Circuit in Atlanta), have demonstrated that law is above the commercial private interests of treasure-hunters. SHould you like to be in the other side, it’s up to you! Thanks for permitting me to say my opinion (excuse my awful English) in this Blog! Mariano Aznar wrote: “(1) Odyssey is a treasure-hunter company, nothing to do with archaeology.” Not so. Odyssey has published extensively on its archaeology and its findings. Carol Tedesco, I am sorry but Mariano Aznar is right. Odissey is a treasure-hunter company. There is no other way to call a private company that goes around the world looking for treasures, stealing it. Odissey deals with underwater archaeological objects, for mere commercial purposes and profit. This is not archaeology. Archaeology needs to respect scientific and ethical archaeological methods… it is not enough to excavate and publish some books of nice pics to be archaeologist.. Odissay’s activities has nothing to do with archaeology and is against all codes of conduct of archaeologists.